The Rat Trap trail is located in the RAT-Ridgway Area Trails System near Ridgway, Colorado. At its upper end the trail begins at the intersection of The Big Cheese, Speedy Gonzales and Rattus Maximus. 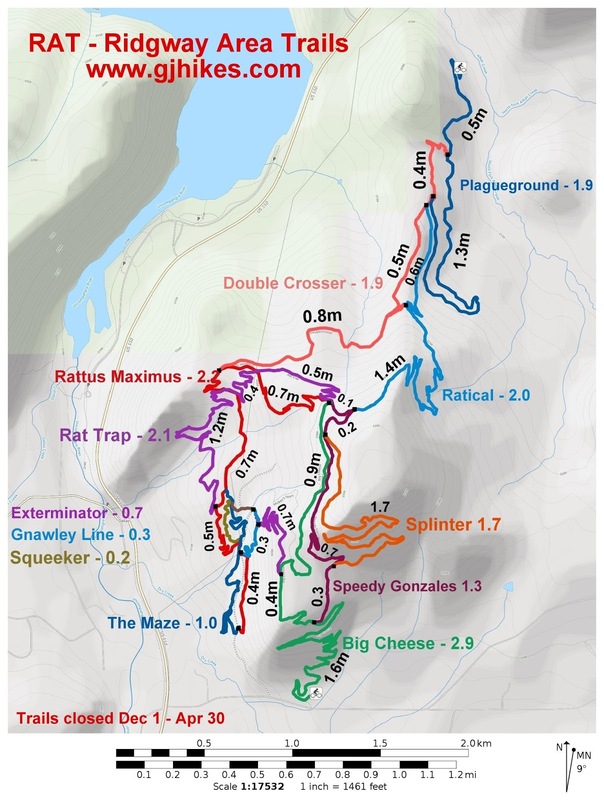 From there it makes an incredibly fun downhill run until it ends a little over 2 miles later at another junction with Rattus Maximus and The Maze. 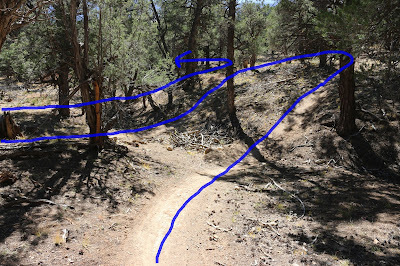 The trail can be ridden in either direction but it is especially fun going downhill. This post follows the Rat Trap in the downhill direction. Either The Big Cheese or Rattus Maximus are good routes up San Juan Ridge to where the trail begins. As the trail begins there is a nice viewpoint overlooking Ridgway Reservoir that is worth checking out. After the viewpoint there are a couple of switchbacks that bring the trail a little ways down the north side of the ridge where it continues along a level traverse. Around the half mile point the trail pops back over the ridge and crosses Rattus Maximus. The trail continues through widely spaced pinon pines. Once the Rat Trap gets going good on the downhill it begins working the natural drainage of the mountain by dipping through shallow washes and zipping its way through the trees. The trail crosses the roots and lower trunk of a tree where there is the option to catch a little air or simply roll right over it. Just under the 1 mile point the Rat Trap begins sharing routes with Rattus Maximus. 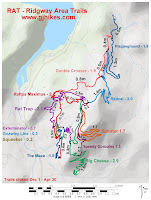 The route sharing is brief when the Rat Trap trail breaks off once again on its own. The trail continues heading downhill making the most fun possible out of what the landscape has to offer. Just over the 2 mile point the trail comes to an end. From here you can jag to the left a little on Rattus Maximus and pick up the top of The Maze or stay on Rattus and head either back up the mountain or back to the trailhead. We opted to do Squeeker and The Maze next. Rat Trap is one of those trails that are fun to do multiple times. The area around the trails here is open to camping but there isn't an actual campground. There are a couple of primitive sites along the gravel pit road. If you do want to camp you are asked not to create any new sites though. We have seen people pull over along the road and camp in the back of their vehicles. If you would like to see it for yourself then all you have to do is grab your bike or 'Take a hike'.